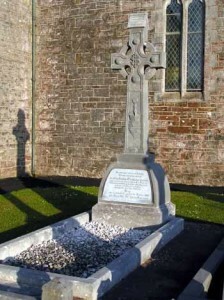 Canon O’Leary, known nationally as An t’Athair Peadar O’Laoghaire, was parish priest of Castlelyons from 1891-1920. He was a prominent worker for the revival of the Irish Language and wrote many books in Irish. Before the Gaelic League was formed he was almost unknown but with encouragement from the League, especially from Seosamh Laoide whom he met in 1894 he began to write. The League gave great prominence to his work and backed him financially. His writings made a great contribution to the development of moderm Irish Literature. One catalogue of his work lists almost 500 items to his credit. Nothing came from his pen before the age of 55 and he continued to write up to the time of his death at the age of 81. His advanced years may account for some errors in his autobiography. The priests work for the revival movement was recognised in his own lifetime. In 1906 he was made a Canon of the diocese of Cloyne. On 26th June 1911 he was given the freedom of Dublin. In September 1911 he was given the freedom of Cork. In 1919 he was given the degree L.L.D. by the National University of Ireland. 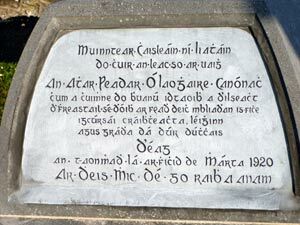 In Canon O’Leary’s time the last generation of Irish speakers was still alive. These Irish speakers were the senior age group in the parish. It was the Canon’s custom to speak Irish to any of those who showed an inclination to speak it. He is also known to have preached in Irish on a few infrequent occasions. Canon O’Leary died on Sunday 21st March 1920 in the parochial house. He was buried in the Churchyard of St. Nicholas’s Church three days later after eleven o clock Mass. There was a large attendance of parishoners and clergy at the requiem among them Osborne Bergin and David Kent M.P.